QuickBooks Online’s mobile app lacks some features found in the browser-based version, but it provides mobile access to tools you may want on the road. First, it’s free (except for your mobile data plan costs). Second, it’s good. And QuickBooks Online’s mobile app offers more functionality than you might expect. Available for iOS and Android smartphones and tablets, it gives you remote access to the features that you probably use most frequently on your desktop or laptop. 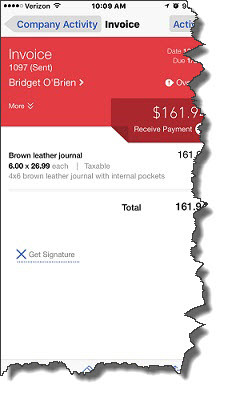 Figure 1: The navigational menu in QuickBooks Online’s mobile app slides out from the left side (iPhone 6+ version pictured here). Since you can already access QBO on a laptop, why would you need an app that’s missing some of the main site’s functionality? You don’t, necessarily. If your work doesn’t take you out of the office much and you don’t travel for the business, downloading the app may just create one more icon on your smartphone screen that you always see but never open. Have to look up a price and description for a product or service. Figure 2: Using QuickBooks Online’s mobile app, you can create sales transactions wherever you are. QuickBooks Online’s mobile app is far from a replacement for the browser-based version. It has numerous limitations. For example, there’s no dashboard — no home page that gives you an overview of your finances and provides reminders about tasks that need to be done. Rather, the app opens to Company Activity, a list of the most recent transactions. Customer and vendor records are not quite as detailed, and you can’t view or work with your Chart of Accounts. Some settings can be altered, but not nearly as many as on the main site. There are only two reports available, Profit & Loss and Balance Sheet, which is a tiny percentage of what’s offered online. You can’t enter and pay bills, create purchase orders, or work with payroll. And you can’t check inventory levels. But the app isn’t designed to be a management or everyday tool. You wouldn’t begin your QuickBooks Online experience with the mobile version; setup and high-level functions like reports, bank reconciliation, and assignment of user roles would be done online by the administrator. There’s a separate application for Intuit’s online payroll, and activities like issuing credits and defining recurring transactions would more likely be done from the office. 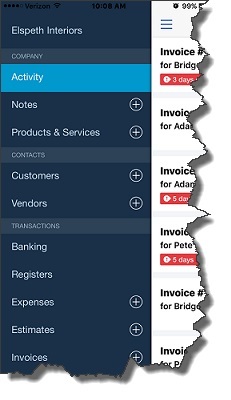 While they’re laid out differently, the QuickBooks Online mobile app manages to pack a lot of detail in a small space. It includes the features that a remote worker would most likely need to use. And some of those are quite comprehensive. Forms in the app, for example, lack very little compared to those in the browser-based version, especially those that deal with expenses and payments, which are often done outside of the office. 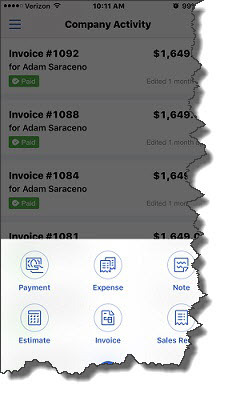 Figure 3: The QuickBooks Online mobile app looks different from the browser-based version, but it’s very easy to use, and some screens are quite detailed. The ability to do accounting work on an app away from the office offers convenience and flexibility that browser-based QuickBooks Online doesn’t. First off, mobile applications show a degree of professionalism and responsiveness to customers and vendors you meet with outside the office. And it keeps you in touch with some of your financial data when you’re on the move. But can using it create problems? Possibly. Data entered in the app shows up in the browser-based version as soon as it’s entered and saved. But you or your administrator wouldn’t necessarily know to look for an onslaught of expenses or invoices, and by the time they’re discovered, there could be some complications. So if you’re planning to let employees loose on the QuickBooks Online mobile app and you expect that they’ll use it frequently, it’s best to establish policies ahead of time and make sure that the work that’s done remotely will mesh with the rest of your accounting activities. We can help you prepare well for your new mobile capabilities.